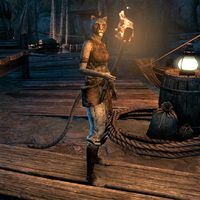 Hedani is a Khajiit and Zan'hi's lover. You can find her and Zan'hi in the cavern area of the Shimmerene Waterworks. When you approach their location, you can hear a bit of their conversation. Zan'hi: "He is mad as a sugar-sick frog! Please, Hedani, you must go. If only for a few days." Hedani: "Will you at least come with me?" Zan'hi: "I want to, my love. But I still have much to do. Who's this now?" Hedani: "One of your friends from Mother's Den? Please, Zan'hi, be quick"
Hedani is removed from the game after completion of the quest. This page was last modified on 24 March 2019, at 18:15.